As a casual macOS bug hunter, I often wonder (worry?) if the number of bugs in Apple’s desktop operating system are decreasing. Good news, in each new release of macOS, it appears that new bugs are constantly added! In this blog post, we dive into a rather annoying bug apparently introduced in macOS Mojave (10.14). Though it doesn’t have significant security implications, it can bring any macOS Mojave system to its knees… forcing the unfortunate user to hard-reboot their shiny Mac. It may come as a surprise, but I rarely (if ever) go off hunting for bugs in macOS. Yes, due to my stint at the NSA I’m often looking at things from the viewpoint of a hacker - so occasionally will go off and poke on the OS. However, the majority of the time, I’m minding my own business hard at work on tools such as LuLu or TaskExplorer. But often tool development is enough to uncover serious vulnerabilities in macOS (such a kernel mode panic or a kernel mode heap-overflow). When Mojave was released, I started to receive reports from users, that TaskExplorer would cause the entire system to fully hang…badly. Like, even the spinning beach ball of death would refuse to spin. A hard reboot was the only option that would bring Mojave back to life. Besides inconveniencing users, (and yah, not stoked to be labeled “extremely careless”), I was rather perturbed as TaskExplorer had been running without issue for the better part of a year. Was a change in Mojave ultimately responsible for the system lock-up? Let’s find out! 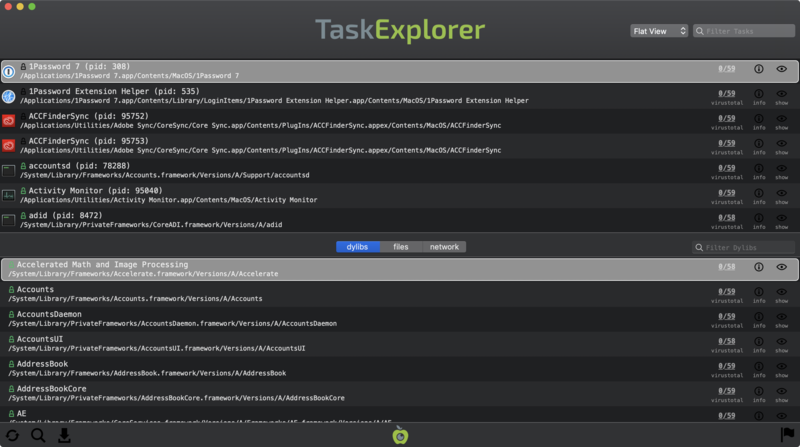 TaskExplorer is a neat utility that allows one to visually explore all the tasks (processes) running on your Mac. For example you can quickly see a task’s signature status, loaded dynamic libraries (dylibs), open files, network connection, and much more. Many exploits rely on an entitled process loading an attacker controlled dylib. Entitlements (which afford process special rights), are applied at the process level. Thus, a dylib loaded into a entitled process automatically inherits its entitlements! To view the entitlements of a process either use the command: codesign -d –entitlements - /path/to/application, or via the GUI by means of the Whats Your Sign utility. In terms of malware detection, advanced macOS malware may run as a dylib to persist (i.e. via dylib hijacking) or to avoid detection. Apple’s built-in Activity Monitor application does not show what libraries a process has loaded. Thus, if a malicious backdoor is compiled as a dylib, it is clear to understand why it may be difficult to detect (vs. a standalone binary or application that would be readily visible). So how does TaskExplorer enumerate loaded dylibs? Invoking the task_for_pid function to retrieve a task port to the remote process. This allows TaskExplorer to read the memory of the remote process. Iterating over all dyld_image_info structures and invoking the mach_vm_read function to read the address to each loaded dylib’s path. End result, a list of the paths of all dylibs loaded in the remote process. It should be noted that stealthy malware can “unlink” itself from the list of dyld_image_info structures. However, this technique has yet to be observed in the wild! According to its man page, the vmmap utility will “display the virtual memory regions allocated in a process” …which also includes the path of the binary that “backs” relevant memory regions. This was all well and good …until Mojave. 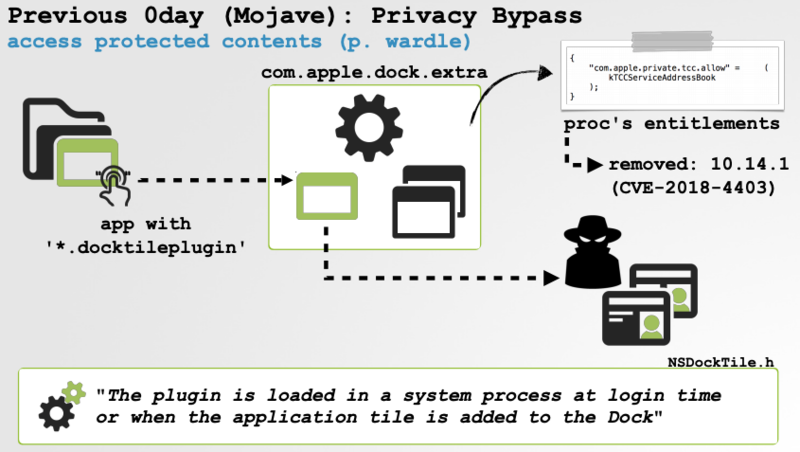 As previously noted, when Mojave was released, users reported that TaskExplorer would cause the entire system to fully lock up. I was able to easily replicated the bug, both in a VM and on my personal system. A hard (manual) reboot was the only way to bring the macOS system back to life. Digging into TaskExplorer’s code, I quickly tracked down the code responsible for triggering the system deadlock. Turns out when TaskExplorer invoked vmmap in order to enumerate the loaded dylibs in a remote process, the system would lock. Exploring further, I determined that this lockup would only occur when the remote process had the process id (pid) of 1. Note this will lock up any macOS Mojave system! 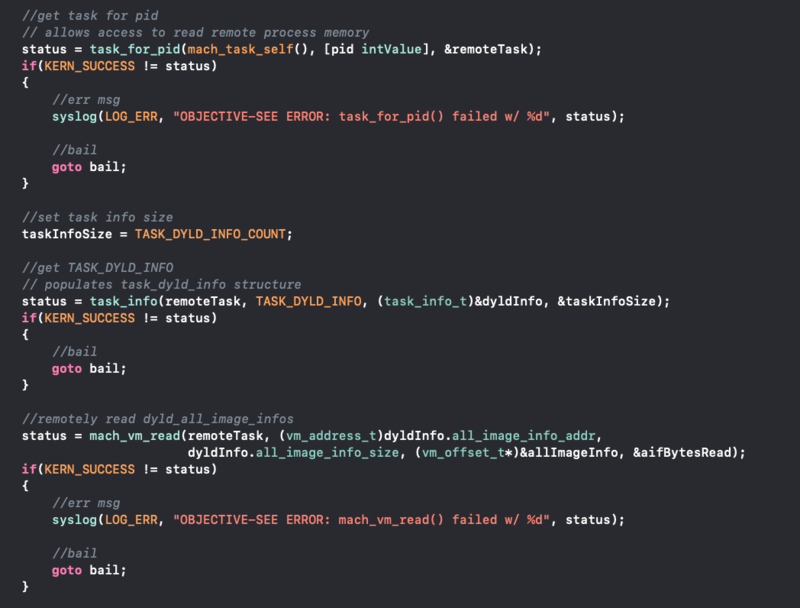 What’s special about process id (pid) 1 and more importantly, why does this crush macOS Mojave? Let’s dig into these questions. First, pid 1 always belongs to launchd …which is directly executed by the kernel during the system boot process. As the first user-mode process, its pid is understandably 1! It is the arbitrator of many (all?) other user-mode processes, and if launchd would ever become uncommunicative, the system would quickly devolve into a point of no return (yes, foreshadowing!). This brings us to our next question, why does vmmap 1 cause macOS to lock up!? Only one way to find out - let’s dive into vmmap's code! First, recall that vmmap can enumerate the virtual memory regions allocated in a (remote) process…such as launchd. In order safely do this, it first suspends the process, enumerates allocated memory regions, the resumes the process. In the debugger backtrace (bt), we can see that Symbolication'task_start_peeking calls task_suspend to suspend the process, before taking a memory ‘snapshot’. In the above disassembly of the CSCppDaemonConnection::CSCppDaemonConnection method, note the various XPC calls such as xpc_connection_create_mach_service and xpc_connection_resume. XPC is an interprocess communication (IPC) mechanism of macOS that is largely facilitated by launchd. When the symbolication logic within vmmap invokes such methods (specifically the xpc_connection_resume method which in turn calls the _xpc_look_up_endpoint function) these are routed to launchd. Unfortunately as launchd has been suspended (by vmmap), these XPC requests are never serviced - and instead block …meaning vmmap hangs (awaiting a response), meaning launchd is never resumed (by vmmap), which means the entire system grinds to a halt, and dies a horrible horrible death. The exact XPC call that appears to block (and hence trigger the deadlock) is a call to libxpc’s _xpc_look_up_endpoint function. The endpoint it is trying to resolve is: com.apple.coresymbolicationd. 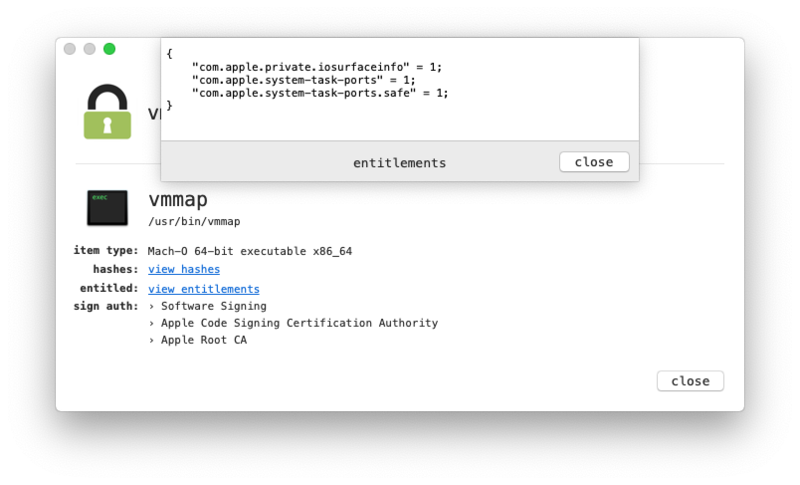 In this blog post, we dug into why (on macOS Mojave) executing vmmap against launchd (pid 1), deadlocks the entire system. In short, after vmmap has suspended launchd it (indirectly) attempts to ‘call’ into launchd via XPC. As launchd has been suspended (by vmmap), everything grinds to a halt. Once again, tool development (TaskExplorer) was enough to uncover a rather serious flaw, this time in an important Apple utility. I’ve reported this bug to Apple, who have promised to help get it resolved! As noted, older versions of OSX or macOS are not affected. Though I haven’t dug to much into why, it appears that the XPC endpoint resolution is handled in a more graceful manner. Specifically it directly fails with: Invalid connection: com.apple.coresymbolicationd. In this case, such a failure is a good thing, as vmmap can continue and resume launchd (vs. remaining hung as the entire system deadlocks). Please provide an API for trusted, privileged security tools to enumerate dylibs loaded into remote processes. Or, if you’re going to force us to use your own tools (i.e. vmmap) to accomplish such tasks, please please please test them!